It’s been well documented that Fox is likely to get rid of most if not all of the current American Idol judging panel, but here’s some very interesting news — the network is considering a judging line-up of all alums from the show! According to Vulture’s Josef Adalian, feelers have already gone out to Season 1 champ Kelly Clarkson and Oscar-winner Jennifer Hudson, and Clay Aiken and Adam Lambert have both been mentioned as possibilities. Adalian is careful to point out that this idea is still just that — an idea. But it certainly is intriguing, not to mention cost effective (I can’t imagine any former contestant, even Clarkson or Hudson, commanding the $17 million Mariah Carey received). Could it work? I’m on the fence. Idol alumni would certainly be able to relate to what the contenders were going through, though their ability to place themselves in the contestants’ shoes may actually inhibit their ability to be honest and critical when necessary. It’s also possible having Idol family members as judges could make the whole proceedings feel more insular and self-referential, distancing the show from the real-world musical landscape that artists and previous judges Mariah Carey, Keith Urban and Nicki Minaj have represented. The most effective impact of this choice might actually be a marketing one — after all, what would more clearly communicate the reality that Idol is the only singing competition that has produced legitimate superstars than to have said superstars be on the judging panel? Ultimately the success or failure of this idea would come down to who gets selected — Grammy winning alumni make one kind of statement; singers who have had a song or two on the charts make a very different one. So, if this idea does come to fruition, who should make up the new panel? Lots of factors to consider, including representing a variety of musical styles, success in the real world, and choosing performers who are able to both show personality, be knowledgeable about music, and be articulate. Considering Clarkson and Hudson’s real-world success, their involvement would definitely lend this idea credibility, and both ooze personality. Believe it or not, though, I think Adam Lambert would be my first choice for this new, hypothetical panel — he was a brilliant contestant on the show, he’s funny, and he is clearly not afraid to speak his mind. The ability to comment on both vocal skill and performance ability would make him an ideal judge for the show. Should there be a representative of the country genre? Carrie Underwood has shown some sly humor in her awards show hosting, but I’m not sure she’d be able to cut loose enough to make a good judge. Scotty McCreery is probably too young and too green; same for Lauren Alaina. What about Kellie Pickler? Though she wasn’t the best singer during her time on Idol, as she proved in winning Dancing with the Stars last night, she’s got loads of charm. Other contestants I’d consider would include Melinda Doolittle, whose insights on Idology with Michael Slezak are quite astute; Constantine Maroulis, who knows from theatricality (but also from creepy stares into the camera); Katharine McPhee, who’s had crossover success into the world of television; and wildcard Fantasia, who would certainly keep the show unpredictable. When it comes down to it, I think I’d pick Kelly Clarkson, Jennifer Hudson and Adam Lambert. If Kelly said no, I’d go with Kellie Pickler. And if J-Hud declines, I’d sub in Fantasia. Who would make up your ideal Idol alum panel? Let me know! This entry was posted in Television and tagged Adam Lambert, American Idol, Clay Aiken, Jennifer Hudson, Kelly Clarkson. Bookmark the permalink. 7 Responses to Fox Considering Having Three Former Contestants Judge American Idol — Who Are Your Picks? 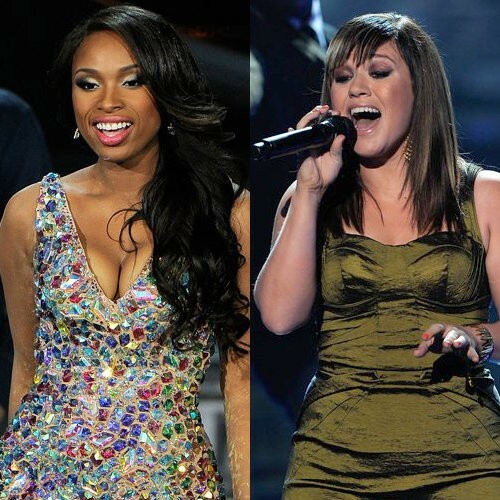 None of the idol contestants except perhaps Kelly and Jennifer have enough experience, music knowlege and respect in their field to give constructive criticism. Most of the ex contestants are still working on their careers. Judges should know music and the music business. They should be able to steer performers to a career beyond just winning the contest. The hardest part of the judging is the auditions – chosing the right contestants. It’s not just finding another Kelly, Carrie, David, Taylor, Adelle or Beyonce. It’s finding an artist who is unique, not a clone or copycat. If an excontestant (Adam Lambert) has time to be a judge, then his music career must not be going great. Adam hasn’t reached any real heights in his career. He isn’t even a platinum seller. His latest album has only sold 143k in a whole year and has no songs on the charts. His fans are not good judges as to who would be credible on the panel. I agree that Adam’s career success has been middling, at best. (Though I was a fan of his on the show, I haven’t even bought his most recent album). His credibility as a potential judge would be based more on the fact that he was a great Idol contestant while he was on the show than on having a successful post-Idol career. As I wrote in my post, I think if this idea is to work (and I’m skeptical that it could), it would be dependent upon the dynamic of the three judges. If he were surrounded by two former contestants who had more tangible post-show success, I think his wit, attitude and honesty could add something to the proceedings. I think having former contestants is fine, as long as they have advanced to real stars, have had a variety of experiences, and are solid and current performers. Out of the suggested, really only Jennifer fits the bill. Why have all three judges as past contestants? There probably aren’t enough successful ones who have the time. Have one past contestant and pick the other two from different pools. If Keith Urban is willing to stay on, why not let him? It’s good to have a variety of genre’s as well. This year ended up being boring because the contestants all sang the same, ballads, ballads, ballads, and it was painfully boring. We need a variety like we had in season five. There was no energy or spark in this season.